At 2:23pm on September 23, 1938, with the equivalent of just a few minutes more gas left in her tanks, Jackie Cochran's silver P-35 shot across the finish line in the challenging, transcontinental Bendix Race. The triumphant former beautician had just won the cross-country race, completing the 2,042 miles from Los Angeles to Cleveland in just eight hours, ten minutes and thirty-one seconds. Using an innovative, new fuel system, she chalked up another first by becoming the first pilot to finish the course non-stop. Within a year Cochran was awarded, for the second time, the most prestigious prize given to American women aviators: the women's Harmon trophy. 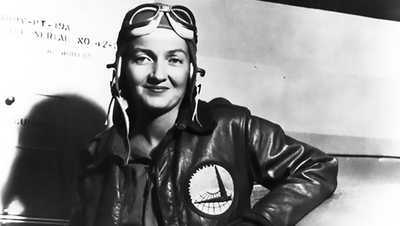 She'd also broken a women's altitude record, climbing to 33,000 feet, and she'd broken several speed records. When Cochran was asked what fueled her ambitions she would reply: "I might have been born in a hovel, but I determined to travel with the wind and the stars." Cochran's earliest memories are of life with a foster family on what she called "Sawdust Road," but what was, in fact, a lumber mill town in northern Florida. In her autobiography she remembered having no shoes until she was eight years old, sleeping on a pallet on the floor and wearing dresses made of cast-off flour sacks. As a child she was hired by a beauty shop owner, and by the time she was 13, she was cutting hair professionally. In the 1920s she became one of the first women to master the newly invented permanent wave. But one of the customers, noting Cochran's spark, encouraged her to do something more serious with her life. With very little formal education, Cochran enrolled in nursing school. Even though Cochran completed three years of training to be a nurse, she never quite adjusted to the profession. In her autobiography, she remembers not ever getting "comfortable with the sight of blood." She constantly had to resist the urge to hand in her notice, reminding herself that a nurse was more valuable than a beautician. But she was never convinced, and an experience delivering a baby to an impoverished mother in Florida helped drive her back to the beauty trade. She remembered three children were sleeping on pallets next to the woman giving birth. "There I was with neither the strength nor the money to do the smallest fraction of what needed to be done to make those lives better... . In a beauty shop the customers always came in looking for a lift. And unless I really screwed up," she concluded, "they left with that lift." Her next job as a beautician at Antoine's in New York's Saks Fifth Avenue brought Cochran into her future husband's world. At a dinner in 1932, the dashing millionaire financier Floyd Bostwick Odlum advised Cochran that if she were ever to realize her dream of setting up her own cosmetics firm, she'd need wings to cover enough territory to beat her competition. Cochran took the advice to heart, and that summer she learned to fly. "At that moment, when I paid for my first lesson," Cochran remembered later, "a beauty operator ceased to exist and an aviator was born." It wasn't until the end of the decade, after Cochran had established herself as America's leading female pilot, that she tried to turn her new profession into one in which she could make a vital contribution to her country. In September 1939, shortly after Warsaw fell to the invading German army, Cochran wrote to First Lady Eleanor Roosevelt arguing that, in the eventuality of American involvement in the war, women pilots could fly military aircraft on support missions, releasing men for combat duty. Implicit in Cochran's letter was an offer to begin the planning for such a squadron of female pilots. Even though she constantly promoted the idea, nothing came of her suggestions for a couple of years. It was the British who resoundingly demonstrated that women were more than up to flying military aircraft. By July of 1941, almost two years into the war, England was desperately short of pilots, and the flight schools couldn't keep up with demand. The Royal Air Force's solution was to use trained female aviators to ferry planes around the British Isles. The women's contribution was invaluable. They were moving planes around by the thousands with just a few minor accidents. In the summer of 1941, Cochran spent some time in London studying how that operation worked. When she returned to the U.S., President Roosevelt asked her to research ways of using female pilots in the U.S. Army Air Corps. The following summer, Cochran returned to Britain, this time with 25 hand-picked American women recruits who would help ferry planes for the British Air Transport Auxiliary. While Cochran was in Britain, another renowned female pilot, Nancy Harkness Love, suggested the establishment of a small ferrying squadron of trained female pilots. The proposal was ultimately approved. Almost simultaneously, General Hap Arnold asked Cochran to return to the U.S. to establish a program to train women to fly. In August of 1943, the two schemes merged under Cochran's leadership. They became the Women's Airforce Service Pilots (WASPs). Cochran was soon thrilled at the success of her experiment. Her female pilots were no longer just ferrying planes around the states; some were training B-17 turret gunners, others were working as test pilots at repair depots, some were training staff pilots at navigator schools, and yet others were tow-target pilots. In January 1944, the War Department announced that the Army Air Forces women's fatal and non-fatal accident rates were lower than the men's. In March Cochran presented a report of the WASPs achievements to General Hap Arnold. 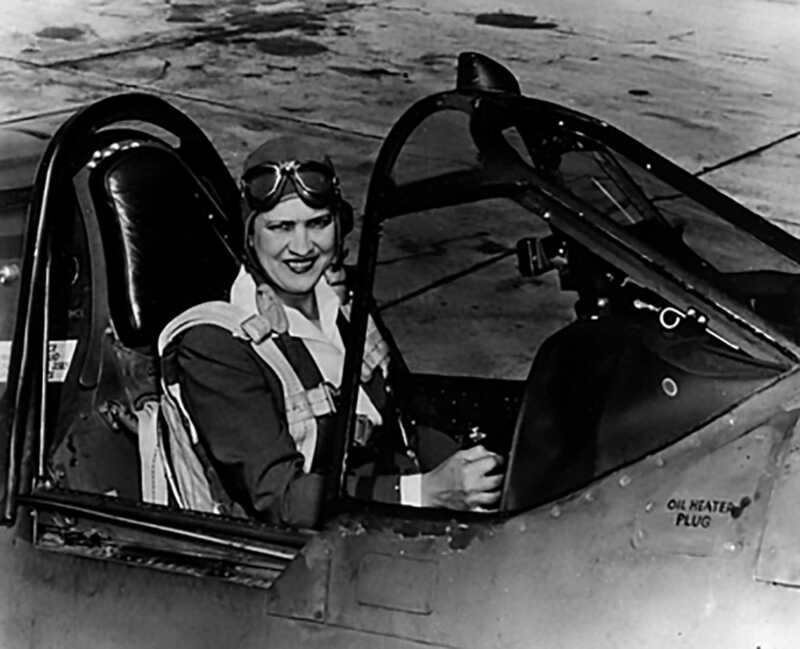 She hoped that it would help convince Congress to bring the WASP formally into the Army Air Forces. Cochran's hopes were dashed by the end of the year. Not only had Congress voted against admitting the WASP into the military, the program had been deactivated. As the war progressed, fewer men were required for combat missions. Also, male pilots conducted an extremely effective campaign against the WASP, arguing that the women weren't needed. On December 20, 1944, the women pilots were flown home. The end of the WASP, however, was not the end of Cochran's flying career. In 1946 she competed in the Bendix Race again, coming in second with a time of four hours and 52 minutes. In 1950 she set a new speed record for propeller driven aircraft, and in 1953 she became the first woman to break the sound barrier. In the end it was her health that grounded her. In the early '70s, doctors told a devastated Cochran that she needed a pacemaker and that she could no longer fly. But even that news failed to slow her down for long. According to one friend she bought a big recreational vehicle that she drove "like an airplane all over the country." Another friend remembers her spending much of the end of her life cycling around her large ranch, back and forth to her vegetable garden. Cochran's spirit finally broke after her husband died in 1976. Her health deteriorated rapidly, and she was often in excruciating pain. Friends say she began talking a lot about death, frequently asking to be buried with a doll that she won as a child and a sword presented to her by the Air Force Academy. The latter she wanted in case she needed to fight her way out of hell. When she finally died in 1980, the sword was returned to the Air Force Academy, but the doll went with her to the grave. Love began flying as a teenager and would go on to become the director of the Women's Auxiliary Ferry Squadron at the age of 28. 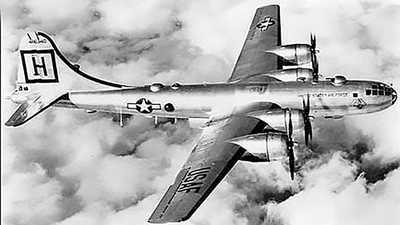 In 1940, Boeing released the B-29 – a plane that would play a decisive role in bringing an end to the war in the Pacific. 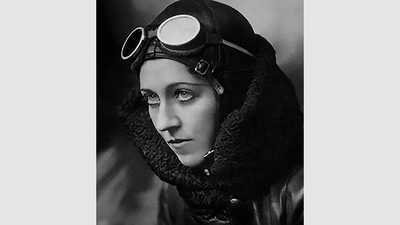 Record-breaking, risk-taking, long-distance flyer Amy Johnson was the first woman to fly solo from England to Australia in 1930.